It’s a very Australian scene: deckchairs outside the caravan, a BBQ on the go – perhaps a couple of tinnies. And, of course, an awning for much-needed shade. But imagine that awning is doing more than shielding you from the sun – imagine it is also garnering the sun’s energy to power your phone, your tablet and even your hairdryer – your entire site, in fact. And when it’s time to go home, you simply roll it up and pop it in the back of the car. Sound far-fetched? With new technology currently under development at the University of Melbourne, it may only be a couple of years away. Based at research institute Bio21, the team responsible are world leaders in the development of organic photovoltaics (OPVs) – printable lightweight, flexible solar cells. The cells are so pliable they can effectively turn any surface into a solar array – from buildings, to vehicles or even clothing. We have a solar panel that can be printed on a standard commercial printer, and then rolled up and taken with you. And how great is that. The pioneering technology was developed by Laureate Professor Andrew Holmes AM with significant recent advances by research group leader Dr David Jones from the School of Chemistry and Bio 21. It now features a new kind of high performance light-harvesting material with unusual crystallisation, which aligns its molecules to improve performance. Moreover, OPVs can be produced en masse at low cost, simply by being printed on large plastic sheets, using standard commercial printers. Their ability to go where traditional, rigid solar panels cannot promises a range of exciting applications. The flexible cells may replace the rigid variety like these. In other words, the everyday trappings of Aussie summers could soon be generating power. There is even scope for using window glass to generate solar power, opening up massive areas of building surfaces for energy production. The secret here is to use the windows themselves to direct the light they harvest to OPVs attached to the window edges. While it is possible to produce transparent OPVs that could cover a window, Bio21 laboratory leader Dr Wallace Wong says they are less efficient than opaque versions. They are also more expensive, requiring a transparent electrode such as that used in computer and smart phone screens. His solution is to use the window as a “luminescent solar concentrator” that can absorb light and direct it onto nearby solar cells. Dr Wong’s research team is developing transparent luminescent dyes that can be embedded inside the window glass panel to absorb light and channel it. OPVs also have the potential to perform dual environmental functions, like covering surfaces of lakes or other large expanses to water to help prevent evaporation while simultaneously generating energy. Another is as temporary covers on grain silos in central Australia, to prevent overheating while powering the fans that stop the grain from sweating. While OPVs’ flexibility and their simple manufacturing technique make them an exciting new technology, at the moment they are only about half as efficient as the larger, rigid silicon cells that dominate solar technology. Nevertheless, they are at the forefront of solar power research, thanks to their promise of cheap production and, ultimately, efficient power generation. Researchers are continuously improving the technology and are confident they will ultimately match silicon cells’ efficiency levels. In the meantime, every iteration yields an improvement in performance. 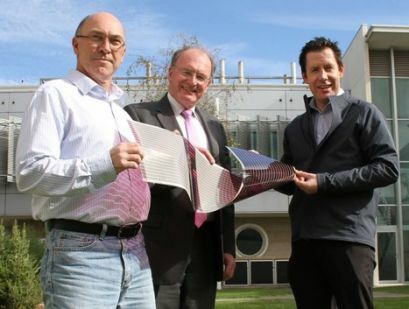 Dr David Jones (left), Professor Andrew Holmes and the CSIRO’s Dr Scott Watkins with a new plastic solar cell. The cells’ initial vulnerability to photochemical degradation – or sun damage – has been overcome through new materials and encapsulation technologies developed with partners CSIRO. And most recently, the team’s discovery of new high performance materials has improved the printing process, taking the technology one step closer to commercial viability. Part of the technology’s commercial appeal lies in its use of standard screen printers. Like any new technology still in its infancy, there are competitors working on bringing similar products to market; in this instance the most notable competing high-performance materials are Perovskites. But while these cells are very efficient, they also feature lead, meaning the cells developed by the University of Melbourne team are likely to be more palatable to the wider community. 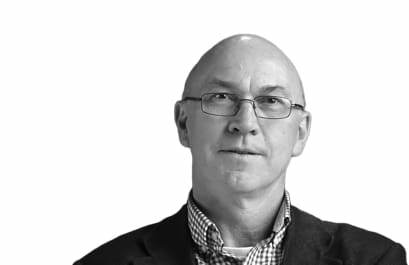 The team now needs to scale the printing process to prove its commercial viability, before it is ready for a private company to take to market – a process that should only take a couple of years, according to Dr Jones.